Keto, keto, keto. 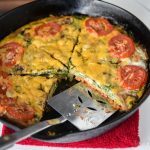 You don't have to be keto to enjoy this, but if you are, you're in luck! 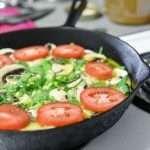 Keto Salmon Frittata is out of the oven in 35 minutes! I did it. 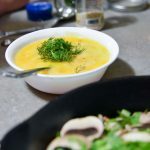 I finished my keto-challenge. It was even primal-style (seriously, a diet challenge that lets you eat cheese is what I'm talking about!). 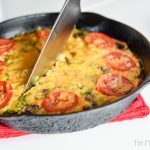 It went alright, especially with Holley's help: challenges help motivate us to be creative with our recipe development, which is how the Keto Salmon Frittata came to be. Thanks, Holley! Yes, this is Holley's recipe, but she's working on a book review at the moment. A book review of “Green Enough” which I highly recommend you read because it is eye-opening about what we're being exposed to from surprising places and products. It's the perfect example of why Holley and I think that Beautycounter is incredible. So I'm telling the story today, sucka! Oh shoot, I shoulda had some story to follow that up. I kinda just want to learn about you! Can I ask you a bunch of questions and you share your stories? Big stuff, like what are you passionate about? What are you working towards? Little stuff, like what'd you have for breakfast? Where are you next traveling to? Or anything in-between. Wait, wait! I got it! Holley, another friend, and I moved into a house together before Christmas. Of course, this has made it even harder to convince people that we're not a couple. And I'm slightly regretting it now because, in this small town, I live with most of my local friends. Which means that I work on the website from home, live at home, and also “visit” my friends at home. I don't have anywhere to go anymore! It's pretty dope. The twinkling lights, sunlight, disco ball reflections, and draped saris make this space super comfortable. Just wait til we get some plants in there! Have you created a sanctuary space in your home? We're still working on the other common areas a bit, including the back deck/BBQ area (which was just hooked up last week as well!!!). Does it ever make a difference to mental well-being having spaces that feel good to be in? 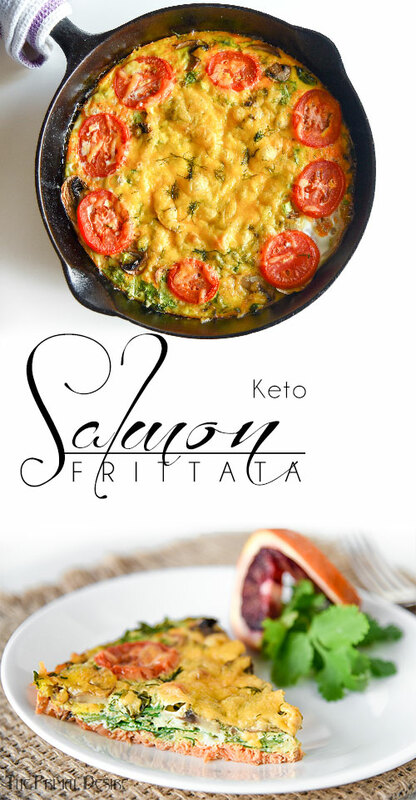 Side note about the Keto Salmon Frittata, we are super lucky to get line-caught, wild salmon from my dad. And let me tell you about Dad and his ice-fishing: he's the guy that shows up to the lake last, catches his limit, and leaves before the other guys are even close. Needless to say, we should be making more canned salmon recipes. Do you have any favorite canned salmon recipes? Open-faced salmon-melts? 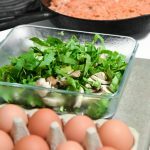 Greek Salmon “Shepherd's” Pie? 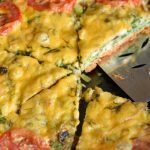 Keto Salmon Frittata? 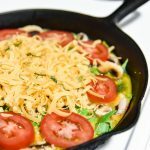 Looking for an easy and quick Keto meal? 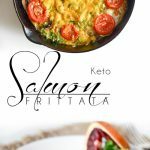 Keto Salmon Frittata is out of the oven in 35 minutes! Press the canned salmon into the bottom of your oven safe dish or skillet. 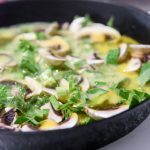 Layer in greens and sliced mushrooms. Break eggs into a bowl and whisk, adding salt and pouring overtop of the layers, trying to get an even distribution of eggs. Lay tomato slices around the edge. Sprinkle optional cheddar over top and finally the dill. Pop in the oven and bake for 35 minutes. 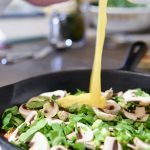 Don't have a cast iron pan? You can get one here, but an oven-safe casserole dish works great as well. A light coating of olive oil or butter will help prevent sticking. Ditch that non-stick cookware! I am looking forward to trying this. Can you use regular canned salmon rather than the smoked canned salmon? For sure. We tried both options. 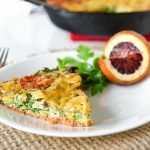 Salmon and eggs are the perfect combo and this frittata looks dreamy! Saving this one for weekend brunch. Ohh nice! 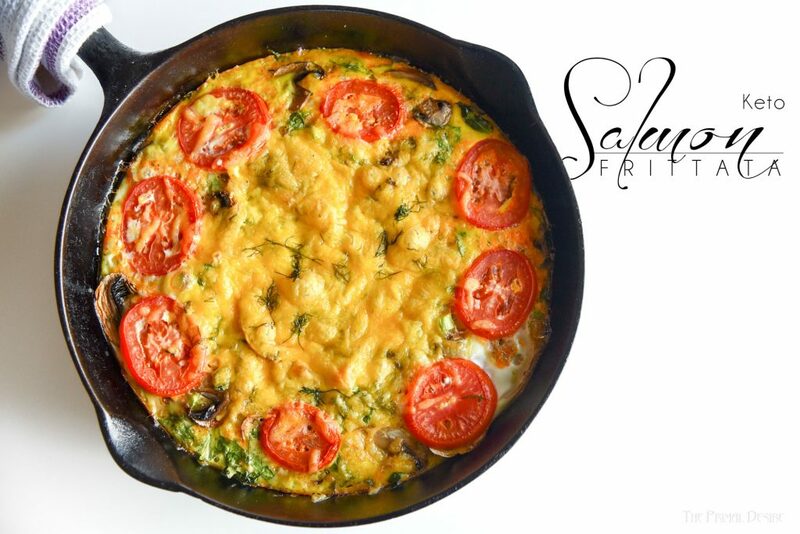 So my middle kiddo is obsessed with salmon and she would just freak out if I made this – I do fritatas on Thursdays so I’ll have to give this a try! Thanks! Looking forward to hearing how it goes Renee! how lucky are you to have all that wild FREE salmon!! Spoiled!! 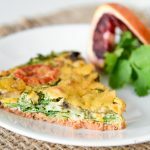 I really enjoy smoked salmon, and in a frittata sounds fabu! This looks great! I’ve never baked eggs. Time to give it a try! Never made a quiche? It IS time! 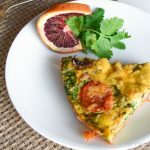 I have never thought to put salmon in a frittata, but it looks delicious! Thanks for the great idea! 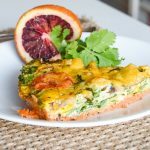 I love salmon and eggs together, one of my favourite combos – thanks for a great recipe! Will try it soon. You bet Jo! Let us know how you like it. Yum! I need to try this – never had salmon for brekkie before! Really? You’ve never had eggs benny with salmon before? YUM! They are so delicious ! Totally love it ! Glad you liked it ChihYu! This looks incredible. Shared this on facebook :). My Dad is really into fishing as well. He scuba dives and spears them. Scuba fishing!!!?? Awesome, where does he do that? That would be so cool! I love salmon and egg dishes. This looks amazing! 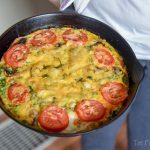 Such a pretty and healthy frittata!